The Amish Bow-Back Chassell Windsor Chair is built in a classic Windsor style and has eight traditional spindles. This Windsor chair is American made also using American hardwoods! You won't find a better quality kitchen chair or dining room chair! 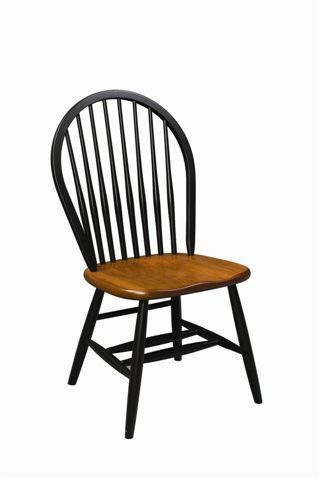 With its sleek design and broad bow back, the Amish Bow-Back Chassell Windsor Chair makes a great addition to any home or restaurant. Seven-Spindle and Nine-Spindle Windsors are of traditional design. Chairs with other amounts of spindles in the back, such as the Eight-Spindle, are of a more contemporary nature. The Windsor armchair has the popular continuous arm design. Windsor Chairs look great with Dutchcrafters Amish made Farm tables! Please call DutchCrafters today at 866-272-6773 to speak with one of our Amish furniture specialists with any questions about this Windsor dining room chair. We'll be happy to assist you with stain samples or to get your order started - all that is needed is a 30% deposit. The beautiful dining room table shown in the scene photo is our Amish Design Your Own Round Dining Room Table. First, thank you so much for the windsor chairs. They are wonderful, beautiful, sturdy, of the period and comfortable. We look forward to many years of good use. Second, I so apologize for this late thank you. I had requested a rush order as my husband and I were getting married. The chairs were received in plenty of time. The chairs looked wonderful with the table that my husband built. Everything was fabulous and we so appreciate everything that you did to help make it that way. Sometime next spring we look forward to expanding our B&B and ordering four more chairs. I will keep your website bookmarked. Thank you again for all of your help in matching wood stains and the expedited manufacturing and delivery.